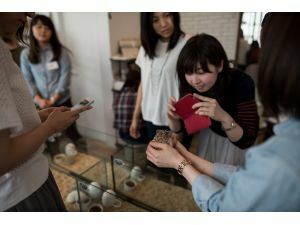 TOKYO (AA) - For a new Japanese cafe it’s not the customers who are prickly, but the residents -- a variety of species of hedgehog, with which customers pay to spend time. The latest among the capital's array of animal-themed coffee shops enables those who don't have the space to keep a pet at home the chance to mingle and interact with various prickly breeds. The interaction is reported to provide customers with a healing sense of comfort, or as they say in Japan iyasareru (to be comforted by something or someone). Located on the second floor of a new building in the Roppongi district, “Harry” -- a play on “harinezumi” (needle mouse) -- is below a rabbit cafe called “Ms. Bunny”. According to Japanese news site Rocket News 24, each person is charged 1,000 yen ($9.23) for every 30 minutes they spend at the cafe on weekdays. Prices are 1,300 yen for weekends and additional options such as photo-taking and feeding are 500 yen each. Once customers disinfect their hands, assistants help them select an animal from an enclosure, and then gently transfer it to a basket or box from where they can lift it out and play.